Pictured: Karen Aston, centre manager of the University of Warwick Science Park’s Venture Centre with Justin Buch, director of Cipher Surgical. A Coventry company which has developed an innovative device that is revolutionising keyhole surgery is entering its third phase of development. Cipher Surgical is now moving forward with the next evolution of its OpClear technology to make it available in even more medical procedures. The company, which is based at the University of Warwick Science Park’s Venture Centre, is increasing the product range to work with a greater variety of telescopic lenses, known as a, laparoscope which are used by surgeons when performing keyhole surgery, and is also improving the performance of existing products for both surgeon and patient. OpClear helps clinical staff maintain vision during procedures by preventing condensation from forming on a laparoscope that is inserted in the body, which can also wash away any particulates during surgery. A clean laparoscope is essential for a safe surgical procedure, but the internal conditions of the human body are rarely conducive to maintaining a clear lens as blood and particulate matter can all block vision, as can the humidity of the body cavity. OpClear helps stop the persistent need to remove the laparoscope from the body, which interrupts the surgical workflow and could endanger the patient. A laparoscope will be removed from the body an average of 13 times during a keyhole surgery to clean it due to condensation or other particulates – but OpClear eradicates the need to remove the scope for cleaning. The equipment, which has been developed at Sir William Lyons Road-based Venture Centre since 2011, has been gaining a huge amount of attention across the globe. It is already being sold in Australia and the launch is progressing well within the UK, but the team is continuing to enhance its performance with further developments. Justin Buch, operations director at Cipher Surgical, said: “We are now working on the third generation of OpClear designed to fit smaller laparoscopes and develop the technology further to meet the changing needs of our clinical customers. “The first generation was launched at the end of 2013 and had a CO2 jet that cleared condensation and particulates from the lens, but it had its limitations. “The second generation added more features, including a saline solution to wash away any stubborn material and as we move forward with the next phase and we are addressing the needs of the market as it reduces the size of the laparoscopes from 10 to 5mm in diameter. “During an average duration keyhole procedure without OpClear, clinical staff would normally remove the laparoscope from the body 13 times to clean it due to condensation or other particulates. Cipher Surgical has a long association with University of Warwick Science Park as it gained around £100,000 of investment from its Minerva Business Angel Network back in 2011. And over the years the firm has received more than £400,000 from Minerva investors and has also benefited from support and advice from the science park’s Ignite programme. Now the firm needs more space and is looking for a new base of operations, but opting to stay within the recently refurbished Venture Centre. “The Venture Centre has excellent facilities and provides us with everything that we could need,” added Justin. 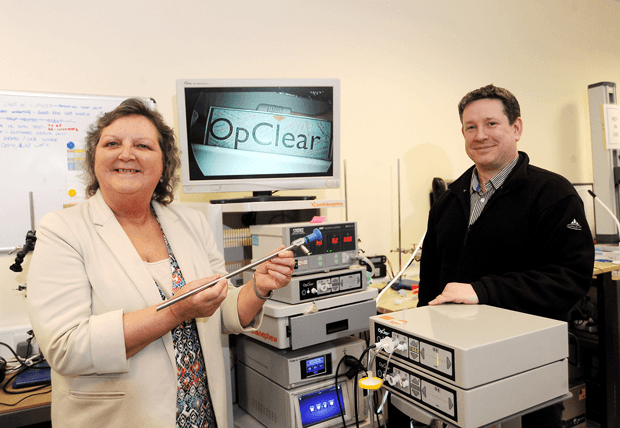 Karen Aston, centre manager at the Venture Centre, said: “Cipher Surgical’s work and development of OpClear is absolutely fascinating. “The technology is revolutionary and the team continues to push the boundaries of development to adapt and continue to transform keyhole surgical procedures. “The team has been based at the Venture Centre for a number of years and we hope our excellent partnership continues for many more years to come. For further information about Cipher Surgical visit www.ciphersurgical.com and for details about the University of Warwickshire Science Park and it’s services visit www.warwicksciencepark.co.uk.